Anyone know what's causing this smog here in Pattaya? 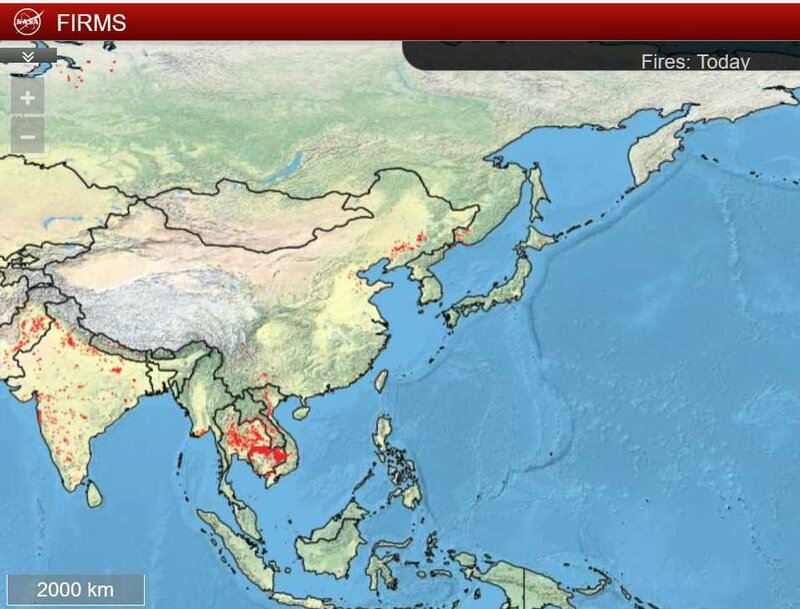 Is it coming from BKK or do we have some other issues here happening around here that's causing it? If it's what I think it looks like, it's pretty typical of the Pattaya skyline the last few years. Pattaya, the beach resort city that doesn't look like a beach resort city. Yes it was quite noticeable on Beach road under the glare of the street lighting this evening .. And earlier this afternoon in Jom' it was quite hazy .. Traffic pollution from the dozens of smoke belching Bart buses don't help the situation ..
Air pollution is from air pollution? Ya think? Besides the local generated air pollution that is getting worse and counting, in dry season the prevailing winds are Northerly from polluted land masses. Where as in rainy season the Southerly,SW winds are from cleaner air. Visibility in area is only a 3 - 4 km. This air is out to get you. today visibility is much better.. Anyway I still blame those dastardly smokers standing outside more than a meter away from any and all no smoking signs for this terrible air quality deterioration ! couldn't possibly be vehicle exhaust,rubbish burning,coal fired power plants or construction dust...no no no it those smokers I tell ya. Could be worse. 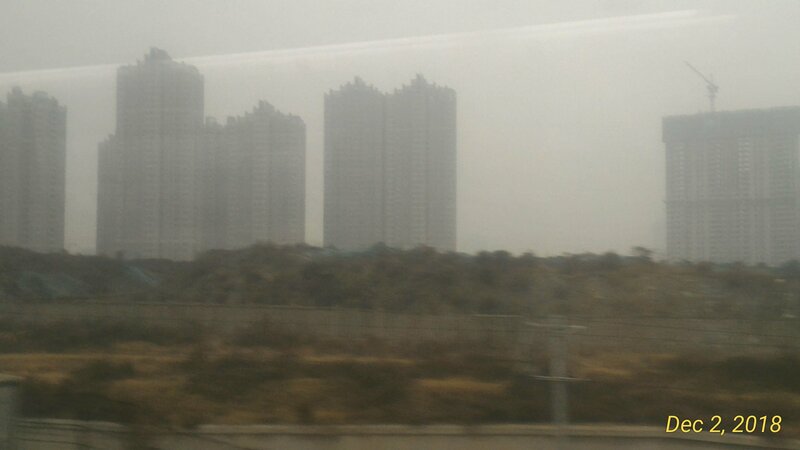 Visited Xi'an and two other large cities in China the beginning of December and the whole 5 days the smog was terrible. So bad you could stare directly at the sun--a small yellow ball. The first day we initially thought it was the moon. If you're wondering why the Chinese come to Thailand, for some it may be to briefly escape day after day of cold, damp, smoggy dim days. Every day was like the picture I am posting. We enjoyed our visit--the Terracotta Warriors were amazing--but were happy to get back to sunny, warm Thailand. Yesterday was pretty bad I agree. Rather like a smokey cloud enveloping the entire area. Today not so bad but still there. It is likely to happen from about October to April. The rest of the year you rarely see much of it. It is down to something called "temperature inversion" I believe. I have lived in South Pattaya, fairly high floor, for many years and have a view to Pratumnak hill, the sea, and up to Sukhumvit and beyond. It was 3 or 4 years ago I think it was that from late October to somewhen in April that there were, literally, only five or so days when the air wasn't pretty awful. Then, around mid April, just like someone flicking a switch, one day I woke up and it was not there. It had vanished. Some years it isn't too awful, some years it is I but it always comes to one extent or another. It gets so bad you can even see it at night in vehicle headlights and street lights, like fog. I keep telling myself I will go live somewhere else for the worst 6 months of the year but I never seem to. I have purchased two air purifiers though, usually going 24/7 when the air is bad, and have put 3M filtrete on the air conditioner intake. If you do live here I very strongly advise the air purifier/filtrete idea. It makes a noticeable difference. Though, if you have any sense, (unlike me) you will go live somewhere else for 6 months. It was possibly slightly worse than the above photo yesterday around Jomtien area. Even today, which is visually FAR clearer, the readings are not exactly wonderful. Very pleased I am not in Bangkok. It was bad here yesterday though. Like a blanket of smoke over the entire area.